The 72’’ – 76’’ Oval Rectangle High Back Dining Set Cover is made to cover and protect an entire dining set: table, chairs and all. Unlike the other 72’’ – 76’’ dining set covers, this one is made to suit high backed chairs. PCI furniture covers are made for a tailored fit to truly lock out moisture, insects, dust, dirt and more. They use the best materials, too. The rugged outer material is a Dura Gard vinyl, which is 7 millimeters thick and treated to block out moisture, insects, UV rays and more. The inner layer is protective and soft to prevent rubbing and scratching of the dining pieces. It’s made with a compressed fleece that is laminated onto the vinyl fronting. Unlike other cotton and fleece solutions, it doesn’t flake off onto furniture. 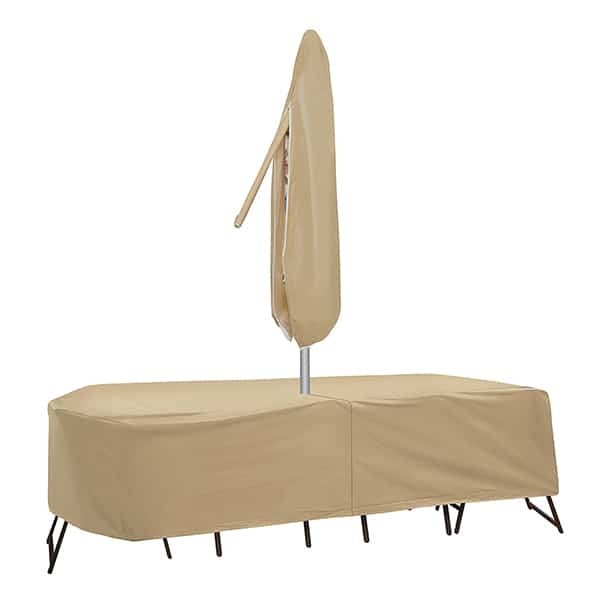 The single best thing an outdoor dining set owner can do to prolong the life of their furniture is to protect it regularly with faithful use of furniture covers from trusted brands like PCI.